tell me about a project that are you working on at your home. it can be anything. are you organizing, painting, building, growing, training your children, you get the gist. 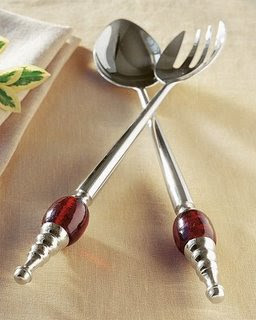 comment to win these pottery barn salad servers. this is the last set that i have to giveaway like this. you are more than welcome to enter even if you have already won a domestic chick giveaway. giveaway will end on friday at midnight. It is easy to let things at home get away from you. These last two weekends, the hubby and I have cleaned carpets, washed windows, sprayed the yard for clover, glued the side mirror back on his car that I ripped off, cleaned out the fridge and freezer, cleaned out the basement work area,(deep breath) and cleaned out the garage. I was reminded that even though I would rather being playing than cleaning, I am very thankful for the home God has built for our family. He has built the four walls, but most importantly he inhabits these four walls. Well currently I'm trying to keep up with all the goodies the garden is producing. I've made tons of zucchini bread and pesto. Now I'm trying to figure out how to can/pickle cucumbers. I'm somewhat intimidated by the whole process but I'll let you know how it goes if I do it! So as far as "projects" goes--the garden is calling the shots. We will soon be working on the project of moving our son to a big boy bed / room. He is 4 and 44 inches tall so the race car toddler bed that he has enjoyed for over a year and a half now just isn't working very well for him anymore! :) I love the addition to music to your blog. Did you just start that or have I just been missing it? Either way, a lovely touch! The next project is to paint the kitchen- but I'm stumped on the color! I removed the carpet and padding from my stairs, sanded the treads then stained the treads and painted the risers. I had to remove the particle board that was the landing and replace it with new wood and a stair tread. I have the bottom half completed and now it's on to the top set of stairs! It's looks so much better! Training Children...and myself! I'm working through a book right now that I had bought to help me with the training of one of my children. I'm finding that it's first working on my heart. It's a slow process, but one I pray that God will move in in a BIG way. oh the projects around here! My husbands dad is coming this weekend to finally finish our half bath and to change out some more light fixtures! But one of my favorite projects are my scrapbooks! It is constant and something I LOVE to do! little, berry stained helpers ranging in age from 3 - 7yrs old. Our family very much appreciates you familiarizing us to the local hidden treasures of Northern Kentucky! Tonight our bellies thank you!! mmmmmmmmm!! !